Dry vs. Wet-Hopped – What’s the Difference? I’m sure many of us have been out, enjoying some fine brews at an establishment and notice a chalk scrawled menu board that proudly claims that this here IPA has been “dry-hopped” or a bar’s Facebook post the boasts, “Zomg, wet-hopped beer on tap, fresher than your dad on prom night!” Either way, we coo, we ahh, we greedily drink it down and proclaim it to be a superior IPA, but what does any of that mean? Aren’t all hops wet when added to the beer? Do they even have anything to do with each other and why does it matter? Before getting into the whats-a-who of each, we should know that dry and wet are two completely different things in beer as they are in life. Well, not completely, both involve hops, but one is a process while the other is a descriptor. To explain dry-hopping, we need to explain some of the baggage that goes along with it. In brewing, hops are regularly used during the boil, added to the wort at various times to impart different aspects of the hops via oils and resins. Hops added towards the beginning of a 60 minute boil are used to add bitterness via acids that are imparted from the dried hop cones or pellets. The hop oils/resins break down over the 60 minutes of vigorous boiling, leaving only bitterness behind from these initial hop additions. To get those lovely hop flavors in the beer, hops are added again in the last 10-15 minutes to give the wort enough time to leech out the oils/resin, but not boil them off. Finally, another hopping happens in roughly the last 5 minutes to impart primarily oils that will add to the aroma. This last step is important for our dry-hopping discussion. After the boil cools, the yeast is pitched, and the beer is transferred to the fermenter to ferment the alcohols. This is when the optional dry-hopping phase happens. For a dry-hopped beer, hops are added to the primary or secondary fermenter to instill just a little more hop goodness. As the beer is cool at this point, mostly oils for aromatics and some grassy hop flavors are slowly leeched out over time with just a touch of beta acids (a harsher bitterness that come out as a beer oxidizes over time). So dry-hopped beers tend to have a strong, fragrant aroma and the fresher IPA flavors associated with young IPAs. It’s advisable to do an agitated pour on a dry-hopped beer to work up a decent head and appreciate those finely crafted smells. So, what do wet hops have to do with this process? The answer is nothing. Well, not entirely nothing as you could use wet hops to dry hop a beer, but that’s confusing things. Wet hops are hops straight off the bine (not vine) that are still sticky with oils and hoppy goodness. 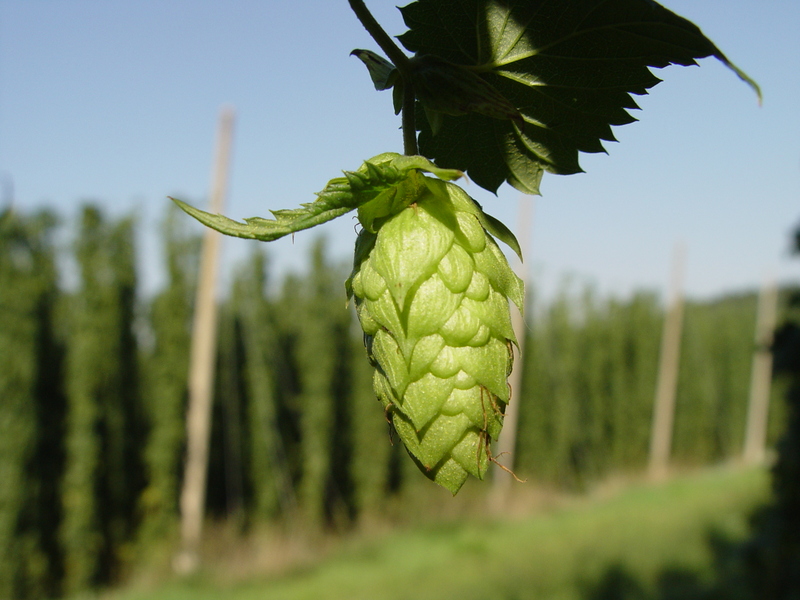 Unlike standard hops, a wet hop has NOT been kiln dried for longer storage or transport. At most, they are refrigerated on their way straight from the bine and into a carefully timed boil at the brewery. The majestic wet hop in its natural environment. 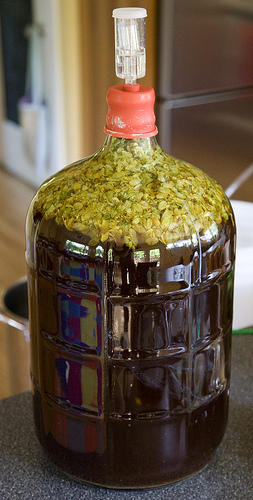 Wet hops are used because they have mellower hop bitterness that elevate green flavors, such as grass, when added to the boil during the brewing process. You actually need to add roughly 10x the amount of wet hops to equal its dried out brethren. The reason for this is to compensate for the amount of water contained in the “wet” hops, which causes the hops to weigh more than their heat concentrated counterparts. A wet-hopped beer screams freshness, so it’s best to drink them ASAP. The best time to find them is around hop harvest seasons, late September – November in the Northern Hemisphere, March – April for Southern. While we are talking about wet hops, I might as well mention fresh hops. Both wet and fresh mean you are getting some pretty damn green hops in your beer, however there CAN be a slight, but important distinction. 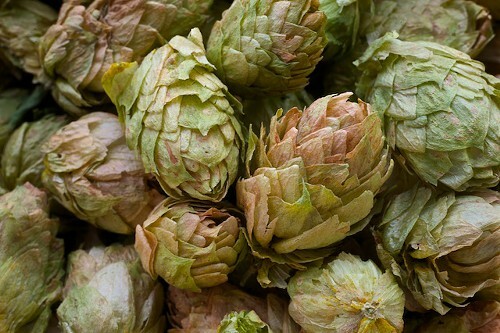 By Brew Association Guidelines, there is little difference between fresh and wet hops, both being “undried.” In practice, however, some beers labeled as fresh-hopped actual mean that the hops were removed from the bine and dried quickly (within a day or two) in an effort to preserve as much of the fresh hops flavors as possible before being used within a few days/weeks. As already stated, wet hops are not dried and added straight to the boil within a day of coming off the bine. For the most part, fresh and wet hops refer to the same thing, but be aware that not all brewers use the terms interchangeably. So there you have it, one a technique and one a description of hops, but with similar sounding nomenclature. Dry-hopping is basically the process of letting your hops soak in the cooled wort as it ferments, slowly imparting aromatic oils and some flavoring AFTER the boil. Wet hops are ultra-fresh hops, typically added to the boiling wort as quickly as possible without being dried, therefore keeping the hop cones in a state to impart their untouched (for the most part) oils and resins. Most people that drink IPAs have probably already had a dry-hopped beer whether they are aware of it or not, the practice is rather common, but wet-hopped beers can be slightly harder to come by. The best bet is to look for widely available Sierra Nevada beers after the fall and winter harvests. Sierra Nevada was the brewery that brought wet-hopping to popularity many years ago and still brew a number of these crazy fresh beers: Northern Hemisphere, Southern Hemisphere (fresh-hopped), and Estate Homegrown. 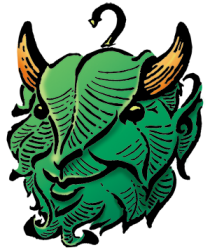 They also recently released Hop Hunter IPA, a year round wet hop beer that they created from a special distilling process that allows them to brew a wet-hopped beer year round. If Hop Hunter is relevant to your interests, and it should be, you can read more about it here.